Categories: Flower Arrangements & Bouquets, Valentine’s Day, Molly & Me Co. Pink & Red Roses in a lidded gift box adds an element of surprise. 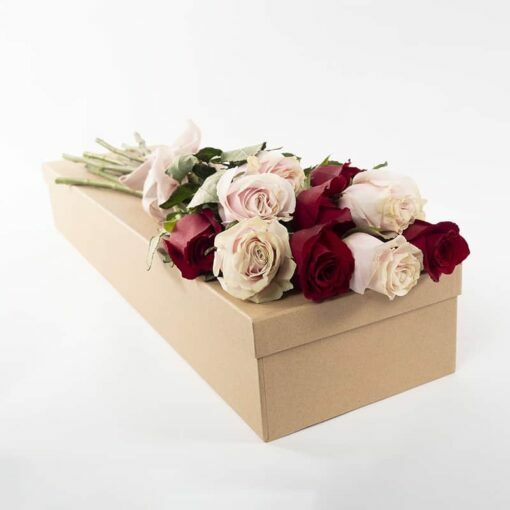 Your loved one will be delighted when they receive this delivery from Bloomin Boxes. Beautifully gift boxed in a solid, lidded natural craft box, we select the best 6 long stem red roses and 6 long stem pastel pink roses. A stunning contrast of colours, with the feminine, soft pink and romantic Red. A popular and romantic choice for your treasured friend or loved one. Don’t forget to add special treats in the box for extra brownie points. Bloomin Boxes has a selection of chocolates, teddy bears or even a Bottle of bubbles.